Three beautiful dressertop projects. Two projects feature enclosures to hold a rosary or other valuables. The third holds a bud vase tube. 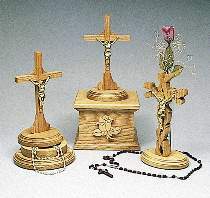 The Jesus figures pictured are no longer available. Projects range from 8-1/4" to 13-1/2"H. All patterns drawn FULL SIZE.